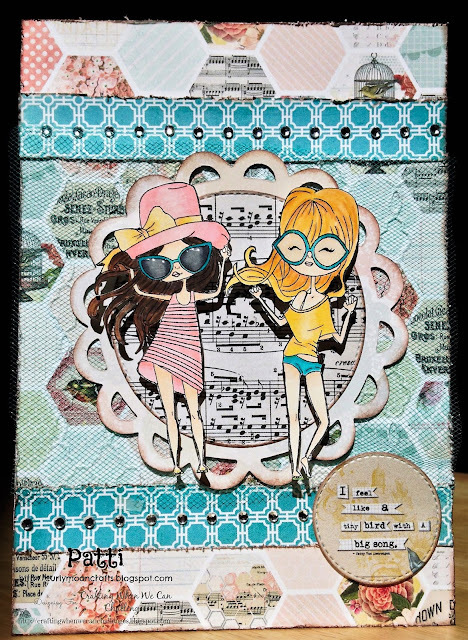 Hi Friends: There is a new challenge today over at the Crafting When We Can Challenges Blog, where the current theme is One For the Girls. Print image onto smooth white cardstock and color with Spectrum Noir Markers, then fussy cut the images. Add Glitter Brush pen to hat bow and alternating stripes on dress, then add Glossy Accents to glasses. Cut MME papers to fit A7 card base, using 2 strips of papers to cover the seams. Distress and ink all edges and assemble card base. From coordinating papers in the pack, use Lace Medallion Doily die to cut a doily shape and the Stitched Circle die to cut the music notes paper, then ink edges. Add tulle in front of the center panel, then add the doily and the circle die to the center. Add the digi images with foam squares. Cut the "Like a Bird" sentiment using a smaller Stitched Circle die and add over the bottom strip. Finish with gems along the design of the 2 paper strips. Now this is too cute! Love all of the patterns and love those sweet images...and the way you added the sentiment... perfect touch! Feels so easy breezy!